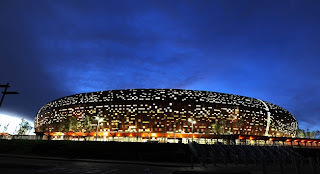 One of the most artistic and awe-inspiring football venues on the African continent, the newly-reconstructed Soccer City Stadium will host the first and final matches of the 2010 FIFA World Cup South Africa™. The ground’s design is inspired by the iconic African pot known as the calabash, and its aesthetic appeal will be heightened when the stadium is lit at night. Soccer City is located in Johannesburg’s southwest and is only a short distance from one of the country’s football-crazy townships, Soweto. About 40 per cent of Johannesburg’s population live in Soweto and this proximity is bound to make the stadium a hub of activity throughout the 2010 finals. The stadium is widely regarded as the heart of football in South Africa as it has hosted many important matches through history. In the mid 1980s, officials came together to build the first international football stadium in the country and the construction was funded from the football fraternity’s coffers. Soccer City hosted the first mass rally of Nelson Mandela after his release from prison in 1990. Thousands of mourners lamented Chris Hani’s assassination at the stadium in 1993. It was also the venue for the 1996 CAF African Cup of Nations final, with South Africa eventually triumphing 2-0 over Tunisia. The original stadium, which was known as the FNB Stadium, had a capacity of 80,000. Upgrades involved extending the upper tier to increase the capacity to 94,700; adding 99 more suites to bring the number to 184; constructing an encircling roof; adding new changing room facilities and installing new floodlighting.